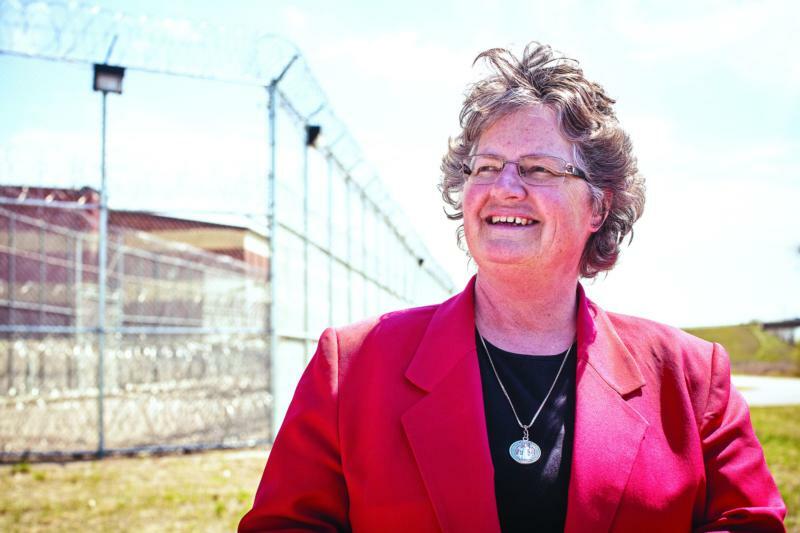 BISMARCK, N.D. (CNS) — One day, while conducting her twice-weekly Bible study with the prisoners at North Dakota State Penitentiary, Benedictine Sister Kathleen Atkinson encountered a life-changing situation. She heard that a prisoner, whom she knew from her visits to the “men in the pen,” was about to be released. How exciting, she thought. But when she saw him, he was nervous and upset. He was from a small farming community in northeast North Dakota and had never been to Bismarck. He was terrified. The next Friday, she met him at the prison gate. He was carrying all his belongings in a backpack and a mesh laundry bag. First they went to McDonald’s, then to buy some essentials. She took him to Grandma’s House, a low-rent apartment building in downtown Bismarck and one of the few places that rents to former prisoners. Once he had a room, they strategized about jobs. And so began his new life. And so too began Sister Atkinson’s new mission to help those in transition. In 2013, she founded Ministry on the Margins, a group to assist those who fall through the cracks during times of crisis — those recently released from prison, struggling with addiction, in between jobs or facing a medical emergency. “We help people who have fallen out of income, lost housing or slipped behind and can’t catch up,” she told Catholic Extension magazine. A rented space in downtown Bismarck has become home central for Ministry on the Margins. It is a coffeehouse, a meeting place, a food pantry — a sanctuary. People can drop in anytime to socialize, get basic supplies, receive employment advice and other counseling and, basically, be uplifted. Sister Atkinson, from the Annunciation Monastery in Bismarck, is ready to dole out whatever is needed — not only encouragement, but often, a frank “get back on your feet” discussion. Still at the core of her ministry, her Bible study keeps people grounded in God. Having faith allows them to aspire to something greater in their life. Sister Atkinson helps them to understand that even if their past may not have reflected the best of themselves, God is merciful and God’s grace is more powerful than the forces that have held them back. By learning to see themselves as children of God, they begin to believe in their own goodness and find that forging a new path for themselves is possible. James found a job. “Now, I even have keys to a bank,” he said, grinning. He is a janitor there. Ministry on the Margins, with a cadre of 60 volunteers, serves about 200 people a week. Every year, more than 1,000 men and women in North Dakota finish their time of incarceration and re-enter society. The group also ministers to family members who have someone in prison. Recently, Sister Atkinson helped a grandmother whose two adult children were simultaneously sentenced for drug use, leaving her with six grandchildren to support on her fixed income. Sister Atkinson was honored in 2015 as a finalist for Catholic Extension’s Lumen Christi Award and received a Catholic Extension grant for her ministry. Chicago-based Catholic Extension, a national fundraising organization, has been supporting the work and ministries of U.S. mission dioceses since it was founded in 1905.